When people trip and fall, they naturally try to break the fall by stretching their arms out and landing on their hands. The force of the fall travels up the wrist and elbow towards the upper body. This energy can break or dislocate the elbow. One common fracture is that of the radial head, right at the point where the energy crosses from the forearm to the arm. The radial head is the part that facilitates hand rotation such as when turning a key. 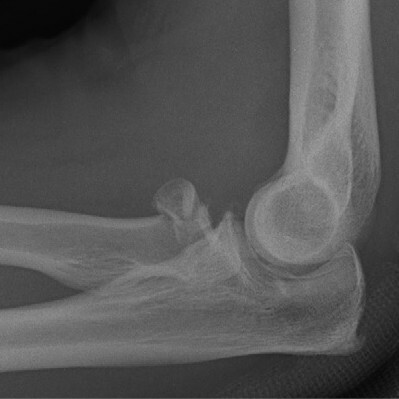 Radial head fractures are common injuries, and may be part of more complex elbow injuries. Other than pain and swelling, patients commonly have difficulty in turning the forearm (palm up and palm down. Depending on how much damage there is, treatment may be nonsurgical ( most common). If the fracture interferes with motion, or is part of more complex injury, then surgery is more likely recommended. There are three surgical options available, and the selection depends on individual fracture characteristics. Option I consists of removing the loose piece to unlock the elbow. Option II consists of fixing the pieces back together. Option III consists of discarding the pieces and replacing them with a metal one. I generally favor putting the pieces back together and try avoiding replacement unless I absolutely have to. Regardless of the treatment used, the aim is to restore movement and strength to allow return to full activities.